When it was time to lay out the electrical system for MogTug, we felt it was one of the easier systems to design. We learned a ton from SyncroBo and therefore a lot of MogTug is the same as SyncroBo. We decided to go Lithium batteries for MogTug as we had gone with SyncroBo. Check out the build log for SyncroBo for more details. We upsized the system to 600ah to cope with the increased demands in the build. The cells are GBS cells, sourced from elitepowersolutions.com. All lithium battery packs require a battery management system (bms) to ensure safe operation. Coupled with some high amp relays, the bms system ensures the batteries are not too heavily discharged and not over charged. The down side to this, is that it greatly increases the complexity of the system. Each battery needs it’s own computer and then each computer needs two relays and a shunt, and a set of circuit boards that mounts onto each cell on the pack. It’s a bloody mess to wire it all and try to make it neat. The upside is that the system does work well, with just a couple of watchouts. First, the circuit boards for the cells, also known as ‘sense boards’, have very fragile wiring. In particular the plug that plugs that connects the boards to the BMS computer is fragile. We have experienced two wire failures at that plug on seperate batteries. When that happens the BMS can no longer see the all the cells so it then disconnects the battery. The only way to fix it is to bypass the BMS. This obviously isn’t ideal, but we had to do it both times it broke. The second watchout is the 200ah cells vs the 100ah. We have two 200ah cell based batteries and one 200ah battery made up of 100ah cells in series and then in parallel to make the 200ah pack. The big 200ah cells seem harder to keep in perfect balance with one another vs the 100ah cells. Our 8 100ah cells stay nicely within .05v of one another while the 200ah cells can vary by. 15 or as high as .2v. I don’t like that spread. While the sense boards do have shunt based balancers, they can only shed .5 amps, so it would be a very very long process to balance the cells that way. I will likely use a programmable RC lithium battery charger to balance the cells. This isn’t practical once you have left on your expedition. In addition to the GBS batteries from Elitepowersolutions.com we also have a battery from Smart Battery (www.smartbattery.com). It’s a different approach vs the naked cells + BMS. They incorporate all of the BMS components into a case with the cells and then they size their batteries to be direct drop ins for common automotive battery sizes. They run about a 20-30% premium to the GBS system, and you can not plug in a video cable and see what’s happening with each cell. But, to date their batteries have performed flawlessly, and are immensely easier to wire. Also, they make their batteries up of much smaller cells in parallel and then in series. So while the battery does have more cells to manage, if you have a bad cell, it can keep working though at a lower capacity. If one of my cells goes bad, that entire battery is offline (with the exception of the 200ah battery pack made up of 100ah cells). 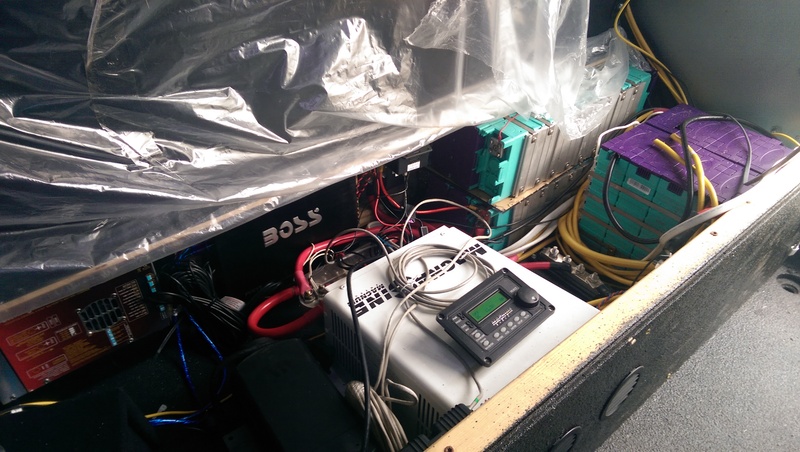 Our Smart Battery is a small 50ah pack and we use it as a backup to our cab 12v system. We will be updating our thoughts on lithium as we progress in MogTug. The weight savings and power density are significant. But the technology is still evolving! As filmmakers charging our equipment is job one everyday before the shoots, so we needed lots of plugs in MogTug. Luckily the military left a nice conduit run with AC plugs. We then proceeded to add some additional plugs in the rear ‘utility closet’ and under the couch. All AC recepticles are protected with GFCI’s. All in we have 18 AC outlets! We have seen the designs with two or four outlets, but when we really broke down how and where we needed power, they just added up. One of the biggest surprises has been how much we use the outside AC outlet. It’s been incredibly useful for charging laptops or using the blender. When wiring the AC runs, I highly suggest you go with stranded wire vs solid core wire. Before this project, I had use solid wire exclusively for AC, but you can get receptacles that work just fine with stranded wire and it will make the wiring job a lot easier in a small space. On the DC side, most small items such as phones, tablets, GoPro, GPS, etc are chargeable on a DC USB outlet. That allows us to minimize the need to run the inverter for small loads. Blue Sea Systems makes the coolest dual plug USB sockets that wire to 12v. All in we installed 8 USB sockets for a total of 16 plugs, and on production days, all of them are use simultaneously. We also installed a couple traditional 12v plugs, and they are useful for things like the 12v slow cooker and GPS (in cab). We learned in SyncroBo that you can never have to much Solar. We managed to fit two 270 Watt monocyrstalline panels on the roof of the box. We paired this with a MorningStar TS-MPPT 60AMP charger. The charger is slightly over sized, but it comes with some networking functions that we wanted. 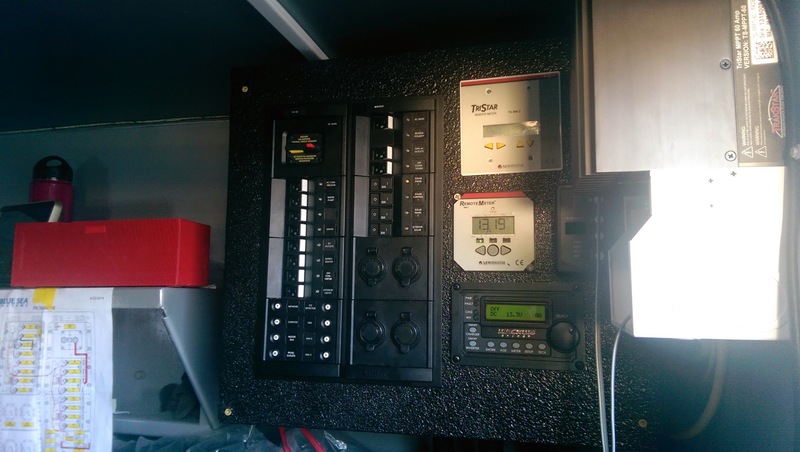 In addition to this primary array we also have a second 15 Morningstar Tristar charge controller that connects to a set of portable folding panels for an additional 120Watts of panels. So we have a total of 660 Watts of Solar. We did not mount our roof panels on tiltable mounts, so we are loosing potential there. 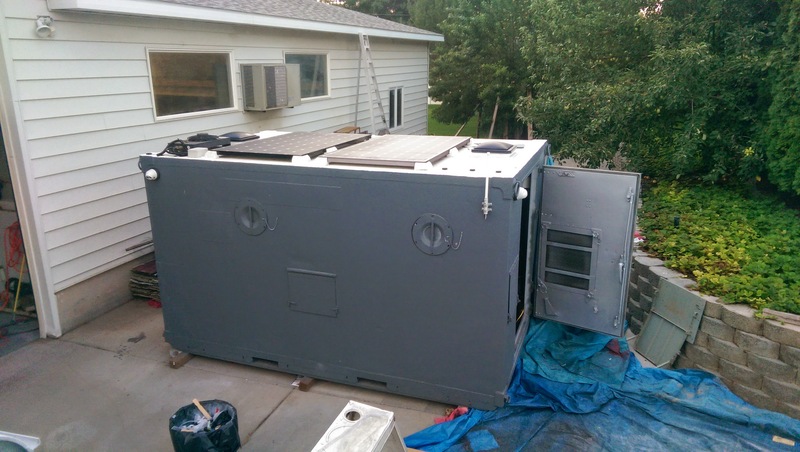 But we did ensure we had an air gap under the panels for cooling, and we can obviously put the portable panels wherever we choose. On sunny days in Baja we see up to 40 AMPS from the roof panels alone. The folding panels add another 8 amps or so if we put them out. I wish we could have fit three! While the solar panels offer a significant charging capability, we also wanted the engine and the act of driving to contribute to the charging needs. We learned in our time in winter in Ukraine and Poland, that solar basically becomes useless, as the sun is so low on the horizon. Having a high amperage charging source while driving is a must. We opted to fit a Zena Power Welder set-up, this includes a high quality 150 AMP power generator, and a control unit that connects to a hand held stick welder for high frequency DC welding. When not welding the unit doubles as a high amp alternator. Unimogs have unused belt races on the crank, and we used one of those to run the Zena alternator. The installation wasn’t difficult but it was time consuming to find the right spot, figure out a belt that would work, and devise a tensioning system. But overall it’s a solid improvement. We have it set to deliver 80amps to the battery bank, limited by our wiring size (if we run another 2/0 we can turn it up to the full 150) 🙂 This has been a great addition to the system and I would highly recommend it. Having a welder onboard is a nice insurance policy if we need to fix something on the trail. Luckily the welding complements don’t add a lot of weight, so it’s easy to take them along. We do have a switch on the dash to be able to turn the alternator on and off, in the event we don’t want it energized. With 3-4 hours of driving (max), with no solar, we are fully charged if we have severely run the batteries down. On most days an hour of driving and we are full, and then the solar keeps us topped up for the balance of the sunlight 🙂 or vice versa. 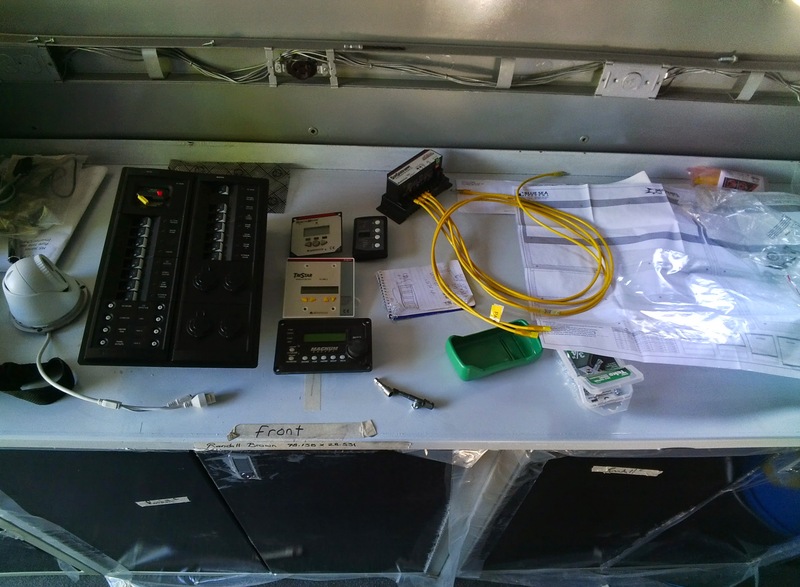 The Unimog’s electrical system is 24volt, but the electrical system for the box is 12v. While we have the Zena Welder set-up, we initially purchased a Sterling Battery to Battery charger to take power from our 24v starting battery and charge the 12v house bank. This unit is only rated at 25 AMPS and in the winter with no solar, it’s not enough on its own. So we normally keep this turned off and treat it like a back-up. For our main inverter and charger, we selected a Magnum Energy MS2812, it’s a 2800 Watt pure sine wave inverter and a built in 150 AMP battery charger. Magnum Energy is a great company, based in the USA with solid products and excellent support. They are an OEM for many of the top boating and RV companies. It’s a big enough inverter to run the AC, which is by far our largest AC load. It has a 50 AMP input, and we connected it to relay that switches between an exterior 15 AMP plug and a 30 AMP plug. We think it will be rare to find a 30 AMP plug beyond Mexico, but it does allow us to plug in the generators for a full 30 AMP service. The key improvement from SyncroBo was the need for a worldwide charger for the batteries. In SyncroBo our shore power connector was strictly 120v, and the Magnum inverter in MogTug is also strictly 120v. Luckily Blue Sea Systems, recently launched a 3 output word charger that is good up to 40 AMPS. It can take any voltage and charge the battery banks in a proper 3-stage process. This thing is built like a tank and fully water resistant. We have tucked it away on the side wall beside the cabinets. We get a lot of use out of this when we want to plug in, but the voltage isn’t 120v and we don’t want to run the generators. We went back and forth on whether or not to bring a generator. The short of it is that we use a lot of power with all of our equipment for filmmaking and the occasional AC 🙂 if we can guarantee sunny conditions and/or regular driving intervals then we don’t have a problem making power. The problem is that we were traumatized at points in Europe when we didn’t drive for long periods of time and it was winter. Eventhough this Pan-American project should have plenty of sunshine, we didn’t want to design MogTug without the ability to have a generator. Once we locked in on having a generator, the next question was what type. Whether we would go with a built in unit or a portable unit like the venerable Hondas. The benefit of the built in is that we can get a diesel unit and plumb it into the fuel system of the truck. The problem is weight and size. Most of the diesel units are a minimum of 5000 Watts and weigh 300lbs+. Oh and they cost about $8k+ or so. We did find a 3200 watt Onan Quiet Diesel which lists for $5k and weighs 200lbs. This unit would have fit on the frame rails and been easy to plumb into the diesel system. But it was the price that kept giving us pause. We don’t forsee using the generator often and when we do, we don’t mind a little inconvienve of manually starting and using a portable unit. 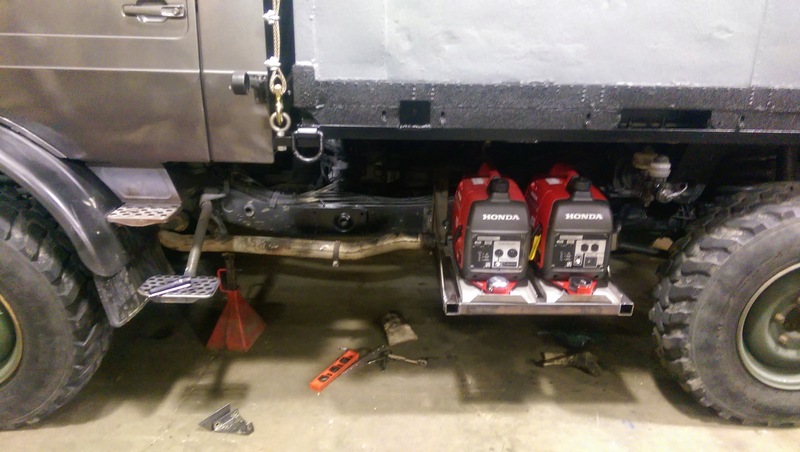 So instead, we went with two Honda EU2000i’s and the parallel kit to be able to link them for 30 AMP service. This saves us about 100lbs and it gives us flexibility. We could use one or two generators depending on our needs, and they are easy to use on set, if we ever needed to power lights or anything. The big downside is that these run on gasoline, and we would have to figure out how to carry it, and how much to carry. In the end we opted for a jerry can 🙂 We don’t plan on running the generators often, and 1 gallon of fuel last 4 hours if the generators are running flat out, and 8 hours-10 hrs on medium load. So the 5 gallon jerry would be sufficient. For simple charging, we would only use a single generator, unless we were in a hurry. For air conditioner use, we would use both its really hot and the compressor has to work hard. But we have found that once cranked a single generator can run the AC. Going with the Hondas, saved us $3k, and thus far it has been worth the hassle. The byproduct of the jerry cans is that we now also have spare fuel for the motos and the Coleman stove. We also sourced these trick lock down plates for the generators that allows them to be locked down in place and secured at all times. They can be run while locked down. It’s from a company called Low Pro, here is the link for more information. http://www.lowprolockdown.com It’s a really trick set up that warrants a short little video demo at some point. drain even when turned off and it’s really nice to be able to positively disconnect some items from power. Most components in MogTug are on a breaker. The key is to plan thoroughly at the beginning so you don’t end up remembering circuits after your fancy new panel arrives. This is the unsexy part of the work, but important because you don’t want to have a failure later. We used tinned copper marine grade wiring and all crimped terminals with adhesive heat shrink. By going with tinned copper wire, you are protecting yourself from corrosion, each individual strand is coated in tin and then the wire strands are put together and in a heavy jacket that is reisstent to gasoline, abrasion, etc. Then you crimp the terminal, which gives you greater vibration resistant than a solder, which can crack. And once you coat that with adhesive lined heat shrink you have a pretty tough cable. We used a few core cable sizes in our build and calculated for a 2 % max voltage drop for each circuit. When in doubt we went a size up on wire. This is one area I see a lot of cost cutting, even by major builders. If you want to get the most out of your system, be sure you have calculated voltage drop and have the right size cable to carry your precious power safely and efficiently. For wiring we purchased all of it from Greg’s Marine Supply. We highly recommend them, great service, fast shipping and great prices. I came across your blog while researching lithium batteries to replace a AGM house bank on my boat.Thank you for the blog as I obtained a lot of information and confidence from it. What particularly caught my eye was your use of a Zena alternator as a charger,I have been using a 250 amp Zena alternator with a Zena controller in a 12V genset I built and it has worked very well charging my house bank. I would be grateful if you could let me know how your setup is going and also what settings you are using on your controller as I am also thinking of using the same cells. I also know of one other Zena successfully being used to charge a house bank but using a standard external controller.